GreenTec Multi Carrier HXF 2802 is an attachment frame for front end loader mount mainly, but can also be mounted on bigger skid steer loaders or the like. GreenTec Multi Carrier HXF offers great flexility as it enables you to mount 11 attachment tools for different purposes, e.g. hedge cutting, fence trimming, guardrail mowing, and cleaning of sidewalks. The Quadsaw LRS 1602 and Cutterbar HL 150 - 240 series are both attachment tools that will fit perfectly to the HXF attachment frame and can be used for hedge cutting and windbreak maintenance. The GreenTec Rotary Hedge Cutter RC 102 & 132 can be used for light hedge maintenance where the hedge material is cut and shredded in one motion, so you do not have to gather the cut-off materials afterwards. 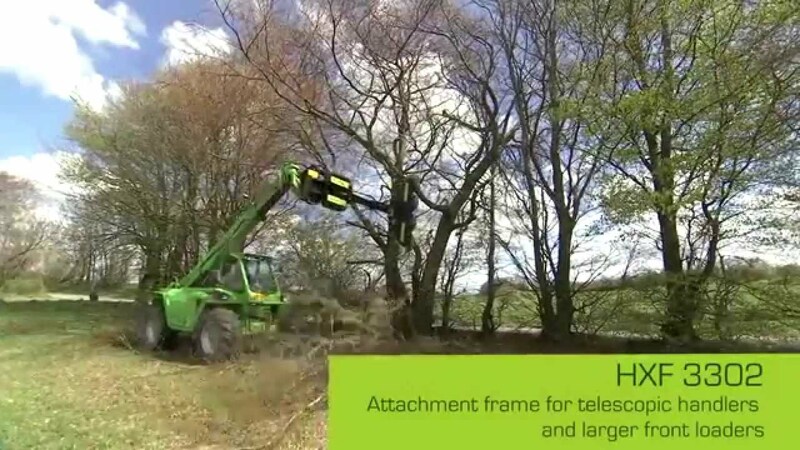 We also offer attachment tools for cutting under fence wires, crash barriers or to cut close around trees in orchards or the like with our GreenTec RI 60 & 80 series. Furthermore, our GreenTec BR 70 & 90 series of weed brushes can be used for effective cleaning of sidewalks, gutters, courtyards, anywhere where there are tiles, asphalt or paving stones. Multi Carrier HXF 2802 is installed in a few minutes in the loading gear bracket. The arm has a hydraulic break-back with auto reset, which also acts as a cushion to the quadsaw. The amount of oil required for Quadsaw LRS 1602 is 40 l/min and for the cutterbar HL 25 l/min. Hydraulic connections needed is one double acting valve and a free return. When installing the hydraulic cutting angle is another double acting valve required Alternatively, an electric coltrol valve can be purchased. * Hydraulic angle control requires two DA connections. When you buy the hydraulic angle control and the e-control with an oil flow divider, you only need one DA connection (and zero-pressure tank drain where it is required). All tools mounted on the HXF frames are pointing toward the carrying vehicle during transport, which makes the Multi Carriers one of the safest solutions on the market. AHS, Automatic Hydraulic Security with pre-pressure, is included on all Multi Carriers. An oil flow divider increases safety and wear of the motor at excessive oil amounts. It is part of the standard equipment. *All HXF Multi Carriers are fitted with an oil flow divider. It ensures that the attachment tool does not exceed the necessary oil flow and pressure.